Kourion is one of the greatest historical sites that you can visit in Cyprus. Kourion is a complex of archaeological ruins of the ancient Greek city that was founded in the 12th century BC. Kourion is best known for its impressive amphitheater of the Greco-Roman era. The ruins are located on the river terrace with spectacular views of the Aegean Sea. Kourion is situated on the south coast of Cyprus, west of the river Lycus, which now bears the name Kouris. The remains of the Hellenic village are near Limassol. Epic events in the city have been recorded by many ancient historians and chroniclers, including Ptolemy, Stephanus of Byzantium, Heracles and Pliny the Elder. 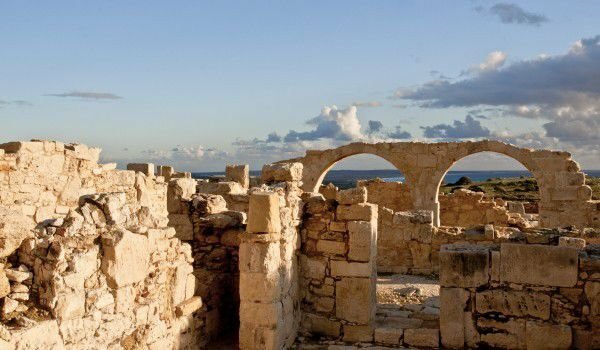 Kourion city lasted from the 12th century BC until the early Middle Ages. Kourion is sitting on the beach, 4 km southwest of the village of Episkopi in Limassol. The earliest evidence of human activity in the fertile area dates from the Neolithic era (4500-3900 BC), while the oldest ruins in the ancient city are the remains of the village itself and the tombs of the middle and late Bronze Age. It is assumed that Kourion was founded by the Argives in the 13th century BC, during the first wave of Mycenae and then in the 12th century as a result of the Doric invasion of Greece. The ancient village has undergone various phases of government - from the Greeks, Romans and Christians, resulting in a very large market square, and early Christian basilica, located beyond the city walls. Very interesting to visit are the Roman public baths that are equipped with hot, cold and hot springs. In the city can be seen a large octagonal pool. Excavations of Kourion began systematically in 1933 by scientists at the University of Pennsylvania’s Museum and continued intermittently during the war until 1954. From there begins the disclosure of Aholovata mosaic, Roman Theatre, Roman Baths, complex Eustolios, arena and the sanctuary of Apollo Hylates, which was opened in the 80s of last century. The biggest attraction is still Kourion’s largest Roman amphitheater that was built probably around the 2nd century and today is a pretty damaged structure. However, it retains its luster, and one can easily imagine the gladiator fights that were held there once. At the outset, however, Kourion Amphitheatre, which seats about 3, 000 spectators, was not used for gladiatorial contests. This is the beginning of the 3rd century in managing by Emperor Caracalla. Then the first three lines of the Roman theater were removed to make a larger arena. 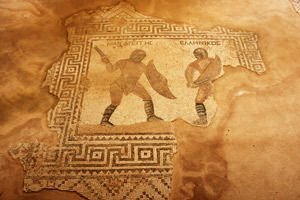 At Kourion was even a Palestra, which was a special place where gladiators trained. Throughout the ancient city of Kourion, you can see very beautiful mosaics, which peaked in the Pantheon of Achilles and the private bathroom of the founder of the city.